Houseplants make for easy, efficient and effective home decorating. Putting together a nice green arrangement will not only add ambiance and personality to your space, but the plants will also help purify the air. Statistics show that spending time around nature reduces stress levels and relieves tension. There’s a reason why hospital rooms are usually packed with flower arrangements. Our team assembled a list of the top ten plants for home decoration, so if you’re considering sprucing up your home with a little bit of green Zen then consider one of these oxygen producing beauties. An Aloe Vera plant is not just an aesthetically pleasing houseplant, it also has a number of healing properties. The gel of the plant can sooth skin burns, detox the body and the plant itself can help clear the air from pollutants found in cleaning products. Aloe plants grow best with a lot of sun, in a pot with plenty of room to grow in with well-draining soil. They don’t like being cold or wet. Tillandsia Terrarium’s, or Air Plants, make for very pretty miniature gardens that you can hang in your kitchen, your office or any other space in your home. These plants are fairly easy to care for once acclimated to their new home. They need to be placed in a bright location, but not in direct sunlight and they need to be watered thoroughly. Although these plants love light and water, they also need nutrients to grow so it’s important to use either a specially formulated food for the plant or a good fertilizer. Tillandsias absorb all nutrients and moisture through their leaves. Also known as “The Pencil Tree,” a Firestick succulent is a beautiful plant that features a tangled mass of thin red and orange branches. This plant greatly stands out so it’s a great option for someone who is looking to add some color into his or her space. The Firestick does contain a toxic white sap, which can result in severe skin allergies so it is important to be very careful when handling this plant. Like most succulents, it requires little water to survive and will thrive as long as all its needs are met. A Beaucarnea plant is very interesting due its oddly shaped base. This is one of those houseplants that is very easy to care for and very hard to disturb. This interesting plant is really fun to decorate with because the smaller plant with the swollen base can create a really fun visual effect. The Beaucarnea is easy to care for because it stores water in its large base so you don’t have to water it everyday, it doesn’t grow too fast so you don’t have to re-pot it often and it’s content sitting in a nice corner that gets plenty of sunlight. Fern plants have been around for 400 million years and there are more than 10,000 species. These popular houseplants require a delicate balance of good light and humidity to survive. A humidity level of 40 to 75 percent will keep a fern healthy and happy. They love the bright light in areas like bathrooms. Ferns can be fussy and challenging and tough to keep alive, but with some experience and good advice you should be able to successfully care for these beautiful and unique plants, which in turn will grace your home with greenery and beauty. There are many species of ficus trees and plants and they all add beauty to the aesthetics of any home. There are trailing plants, which look very attractive in a hanging pot, and there are tree species that grow into tall standing small shrubs. These houseplants love a lot of sunlight and consistent, but moderate, watering. You need to make sure the soil is moist at all times, and only cut down on watering during winter. These plants do grow quickly, so if you re-pot often your tree will get big very fast! Palm trees are one of the most popular tropical plants to grow indoors. They need warm temperatures since most species are native to tropical areas. Palm trees need bright indirect sunlight and humidity to survive. Dry air can weaken and eventually kill a palm tree. During winter months it helps to spritz the leaves of the palm tree with water to keep them moist and slightly raise the humidity. Bamboo trees are easy to fall for, because they are easy to grow, aesthetically pleasing and unique. Bamboo trees have woody-stem grasses and they grow very quickly. 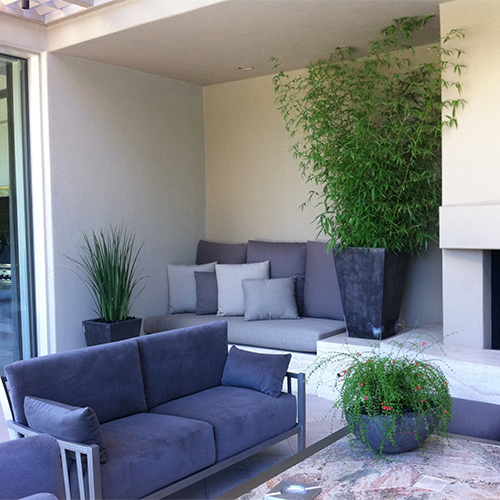 All types of bamboo trees require regular watering and a good fertilizer with extra nitrogen. It’s important to re-pot these trees every few years so they don’t burst through their containers and to protect them during harsh winter months. Sansevieria plants, also known as snake plants or “Mother-in-Law’s Tongue,” are characterized by stiff, upright leaves that stand three to four feet tall. They don’t need much light or water to survive so they’re a perfect choice for a quiet corner of your home. These plants are very tough and can withstand virtually any condition. The only way to make these plants unhappy is to never water them at all or to purposefully overwater them. Snake plants also absorb carbon dioxide and release oxygen during the night (most plants do this during the day), so these are safe for the bedroom. Draceana Marginata, or the Dragon Tree, is an attractive stiff-leaved plant with colorful foliage, which makes an excellent houseplant. These plants are easy to care for indoors, just keep them dry and warm and give them plenty of sunlight. It’s a great plant for space filling and decorating. It’s fun to decorate with plants! If you show your houseplants some tender love and care they will literally bring life to every room in your home. If you’re looking for recommendations for indoor and outdoor houseplants, then don’t hesitate to contact us for help. We can give you the information you need to pick the right plants and we will create a custom plan to help you care for your new addition so you can keep it happy and healthy.